Innovation and agriculture, medicinal plants and biotechnology, this is Tricopharming. Using biological techniques we stimulate the natural capacity of the plants trichomes to be molecules factory. 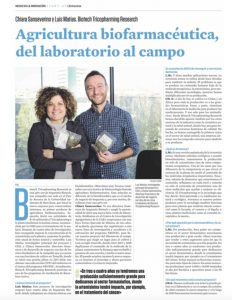 A well done article titled “Biopharmaceutical Agriculture, from the laboratory to the field”, Newspaper La Vanguardia tells our story: our company, our first product and our plans for the future.